Stiffness is a relatively common elbow problem, especially after any type of trauma or surgery to the elbow in an adult. The key to preventing stiffness after a broken elbow or surgery is to start early motion. 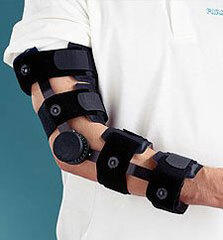 If a significant amount of time has passed and these measures are not improving the elbow motion, and the patient is functionally restricted in their activities of daily living because of the elbow stiffness, then consideration may be given to surgically releasing the elbow joint to achieve an improvement in the motion. The surgery may be done by either open or arthroscopic (minimally invasive) means, with the decision depending on what each elbow has had done previously and its current status. In general, surgery will improve motion. It will not restore motion to normal. The amount of improvement is usually half of what was lacking e.g if an elbow is lacking 60 degrees of extension, then after surgery it will only be lacking 30 degrees of surgery. Copyright © 2019 Orthocentre. All right reserved.